Passed away peacefully on 2.4.2019. An amazing lady who touched so many people's lives with her humour, wisdom and values. 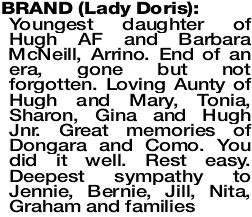 Much loved mother and grandmother of Brian (dec), Jennie, Bernard, Jill, Nita, Graham and families. 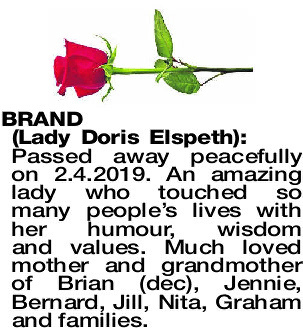 The Funeral Service for the late Lady Doris Elspeth Brand of Opal Murdoch and formerly of South Perth will be held in St Albans Anglican Church, Beaufort Street, Highgate on MONDAY (8.4.2019) at 1:30pm. My Grandmother’s sister. I remember meeting you as a child. With love to the McNeill and Whitehurst descendants. Sincere sympathy to all the family. 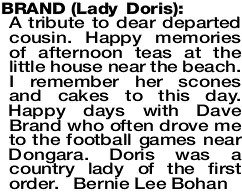 Aunty Doris was a very special lady and always took the time to catch up with the family. 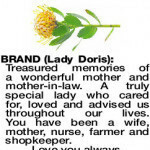 BRAND LADY DORIS We are so thankful that Mum had such a long and in the main, joyful life. 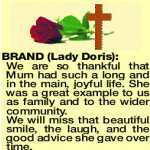 She was a great example to us as family and to the wider community. We will miss that beautiful smile, the laugh, and the good advice she gave over time. 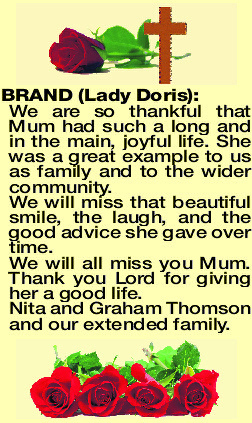 We will all miss you Mum. Thank you Lord for giving her a good life. Nita and Graham Thomson and our extended family. 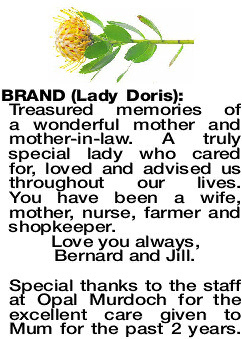 Treasured memories of a wonderful mother and mother-in-law. 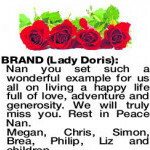 A truly special lady who cared for, loved and advised us throughout our lives. You have been a wife, mother, nurse, farmer and shopkeeper. Love you always, Bernard and Jill. 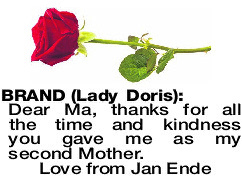 Special thanks to the staff at Opal Murdoch for the excellent care given to Mum for the past 2 years. 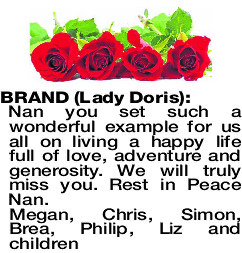 BRAND LADY DORIS Nan you set such a wonderful example for us all on living a happy life full of love, adventure and generosity. We will truly miss you. Rest in Peace Nan. Many fond memories of pioneering days. Loving cousin to Doug. The finest lady I know. 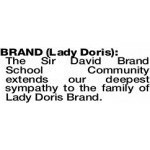 BRAND LADY DORIS The Sir David Brand School Community extends our deepest sympathy to the family of Lady Doris Brand. 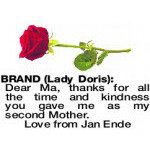 Dear Ma, thanks for all the time and kindness you gave me as my second Mother. Passed away peacefully. 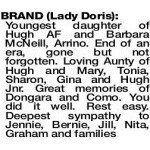 Treasured Aunty of Dorothy, Kevin and families. 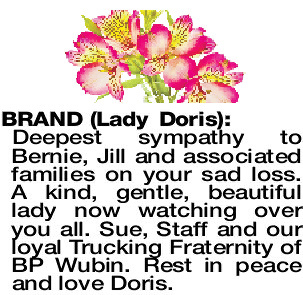 Deepest sympathy to Bernie, Jill and associated families on your sad loss. A kind, gentle, beautiful lady now watching over you all. 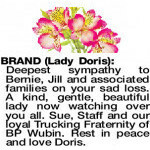 Sue, Staff and our loyal Trucking Fraternity of BP Wubin. 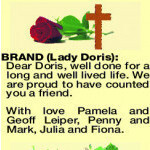 Rest in peace and love Doris. 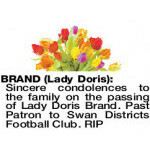 Deepest sympathies to the family of Lady Brand who was the former Patron of our club. A lovely lady. 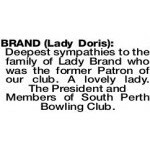 The President and Members of South Perth Bowling Club. 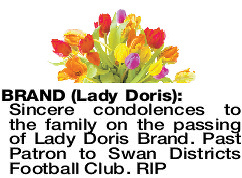 Deepest sympathy to all the family. Life long friend of Archie and Elvie Smith (both dec) and family. 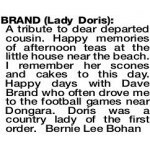 Many happy memories of early Dongara days. 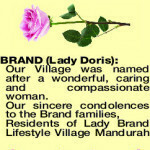 BRAND LADY DORIS Our Village was named after a wonderful, caring and compassionate woman. 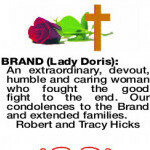 BRAND LADY DORIS Deepest sympathies to the Brand family on the passing of Lady Brand. 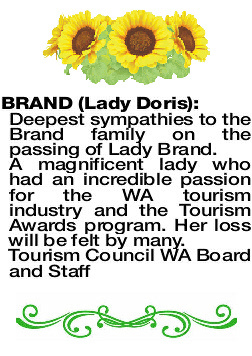 A magnificent lady who had an incredible passion for the WA tourism industry and the Tourism Awards program. Her loss will be felt by many. 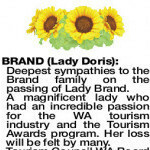 BRAND LADY DORIS Lady Brand was an incredible advocate for the tourism industry in Western Australia. Her ongoing involvement in the annual Tourism Awards helped drive excellent in the industry. She will be sadly missed. 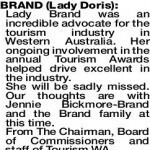 Our thoughts are with Jennie Bickmore-Brand and the Brand family at this time. 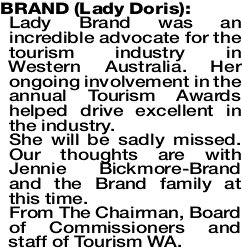 From The Chairman, Board of Commissioners and staff of Tourism WA. 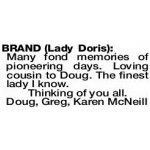 BRAND LADY DORIS Fond memories of a gentle country girl who became the long serving wife of Premier Sir David. 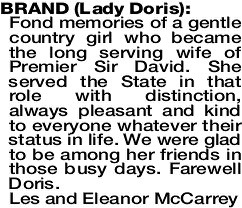 She served the State in that role with distinction, always pleasant and kind to everyone whatever their status in life. We were glad to be among her friends in those busy days. 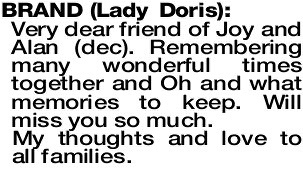 Farewell Doris. Sympathy to all her family. Many great memories of a wonderful woman. 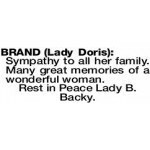 Rest in Peace Lady B. Backy. 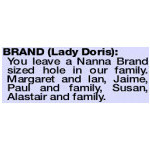 BRAND LADY DORIS You leave a Nanna Brand sized hole in our family. Margaret and Ian, Jaime, Paul and family, Susan, Alastair and family. 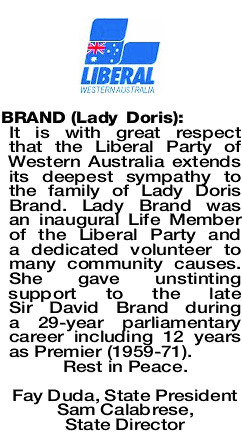 It is with great respect that the Liberal Party of Western Australia extends its deepest sympathy to the family of Lady Doris Brand. 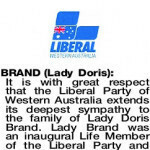 Lady Brand was an inaugural Life Member of the Liberal Party and a dedicated volunteer to many community causes. 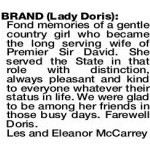 She gave unstinting support to the late Sir David Brand during a 29-year parliamentary career including 12 years as Premier (1959-71). 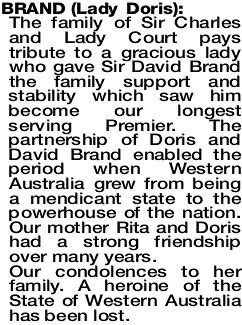 The family of Sir Charles and Lady Court pays tribute to a gracious lady who gave Sir David Brand the family support and stability which saw him become our longest serving Premier. 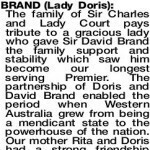 The partnership of Doris and David Brand enabled the period when Western Australia grew from being a mendicant state to the powerhouse of the nation. 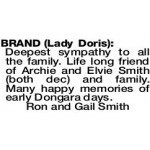 Our mother Rita and Doris had a strong friendship over many years. Our condolences to her family. A heroine of the State of Western Australia has been lost. 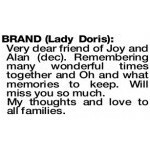 Very dear friend of Joy and Alan (dec). Remembering many wonderful times together and Oh and what memories to keep. Will miss you so much. My thoughts and love to all families. 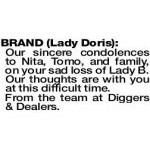 BRAND LADY DORIS Our sincere condolences to Nita, Tomo, and family, on your sad loss of Lady B. Our thoughts are with you at this difficult time. From the team at Diggers & Dealers. 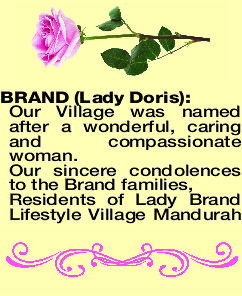 BRAND LADY DORIS Dear Doris, well done for a long and well lived life. We are proud to have counted you a friend. 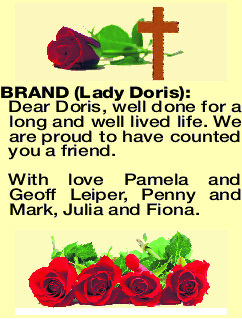 With love Pamela and Geoff Leiper, Penny and Mark, Julia and Fiona. 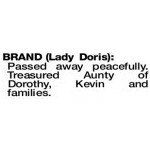 BRAND LADY DORIS An extraordinary, devout, humble and caring woman who fought the good fight to the end. 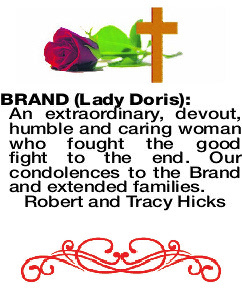 Our condolences to the Brand and extended families.